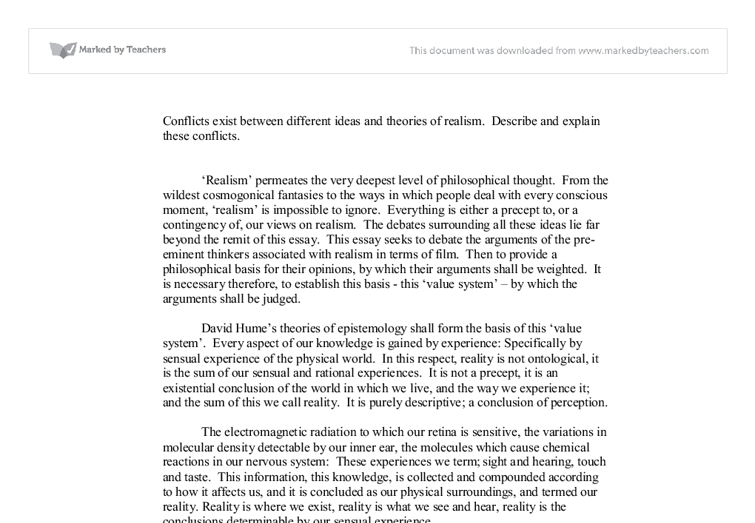 Conflicts exist between different ideas and theories of realism. Describe and explain these conflicts. 'Realism' permeates the very deepest level of philosophical thought. From the wildest cosmogonical fantasies to the ways in which people deal with every conscious moment, 'realism' is impossible to ignore. Everything is either a precept to, or a contingency of, our views on realism. The debates surrounding all these ideas lie far beyond the remit of this essay. 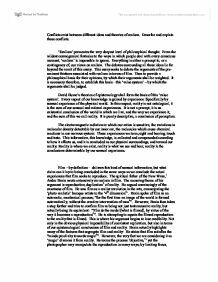 This essay seeks to debate the arguments of the pre-eminent thinkers associated with realism in terms of film. Then to provide a philosophical basis for their opinions, by which their arguments shall be weighted. It is necessary therefore, to establish this basis - this 'value system' - by which the arguments shall be judged. David Hume's theories of epistemology shall form the basis of this 'value system'. Every aspect of our knowledge is gained by experience: Specifically by sensual experience of the physical world. In this respect, reality is not ontological, it is the sum of our sensual and rational experiences. It is not a precept, it is an existential conclusion of the world in which we live, and the way we experience it; and the sum of this we call reality. ...read more. This draws me to the conclusion to be made on Bazin; mitigated reality; "a hallucination that is also a fact9". Another area not addressed by Bazin is the knowledge of film as an artifice reproduction. Suspension of disbelief is a prerequisite to experiencing film. We know it is not the reality of its model, that it is a reproduction. Brecht saw that to have impact a filmmaker must embrace this prerequisite and "remind the audience of the artifice.10" Like a stage play, the audience knows it is not the reality it purports to be. Contrary to Bazin's theory of film being "unburdened by interpretation", Brecht would see the essence of film in the interpretation. That the "expression of spirituality,11" was what gave it reality, rather than "pure psychological duplication12". So now we see reality designated in two conflicting schools. Bazin's mechanical sub creative, duplication and Brecht's interpretation of an obvious artifice. This forces a return to the epistemological mould. While Bazin is correct in his assertion that film is a duplication of the model in almost total exactness, he does not make an account of how ones' conclusion of the sensual reception will be different with film. To speak of objectivity - as Bazin does - is to tread on thin ice. ...read more. It becomes clear that the argument is self destructive, there are too many contingencies to draw a solid conclusion. It is a game of chess between a white knight and a black bishop. If neither of the pieces accommodates the other the argument can continue ad ifinitum. The contingency is the nature of the consciousness, how the conclusion is draw from the sensual experience. Bazin and Brecht's opposing ideas each find their place in the determination of what is reality: Bazin the deliverance of the experience, its sheer similarity, exactness even, to the model. Brecht's interpretation of how what is experienced is concluded. They are different parts of the same system. Films are 'reality' in that they are experienced in the same way as many of the models it copies are experienced. Yet the conclusions determine whether the psyche determines it as reality. Nochlin finds a conclusion of sorts; film mirrors reality, it is an illusion, but to the senses it is also a fact, whether it is reality depends upon the nature of the experience and, most importantly, how it is concluded. Jurassic Park has no model in contemporary 'reality' capable of being experienced. Film is reality mitigated by the fact that it is not what it purports to be. Yet in terms of conscious conclusions, after seeing film, Hume might think that reality is a question of sheer will. ...read more. It is a pity the author did not make reference to Baudrillard's theory of the 4 orders of simulation, because he accounts very well for the simulacric effect of even the most rudimentary simulation - the capacity that even the sketchiest of sketches has to move and convince, to invoke the reality that it fails to represent or directly portray. I don't agree with its argument and I downright contend many of the details, but on the whole this is a reasonably good essay, and the synthesis between rational materialism and relativism that it attempts in the closing paragraph is quite pleasing. The language is sometimes confusing, especially in the lead-up to the conclusion, possibly because the author is trying to impress us with the cleverness of his observation that the arguments for and against the empirical assertion of reality are both unresolvable on their own terms. However, for the most part there is an admirable attempt just to say things as simply and directly as possible, and this is as it should be. I would advise any would-be author of philosophical discourse to pursue clarity and simplicity first and foremost. The use of reference and received theory is good, but bibliography and referencing is not the standard Harvard system that I usually advise my students to adopt. Also the props the chickens used on set. When Ginger is trapped in the cooler she bounces a Brussels-sprout up against the wall instead of the baseball which Hilts used in the great escape. The visual humour, however, is mainly slapstick. When Rocky and Ginger get trapped in the oven Rocky manages to fall into every pie in there on his way to the door. but he doesn't appreciate it, it's as if wives are taken for granted. Connie turns out to be a victim of Carlo's fury - he chases her around the apartment and beats her with a belt, even though she is pregnant and she hasn't done anything wrong - he's the one who is seeing other women! her violent temperament has been 'tamed' to make her into the secret police's top hit man. This is also a postmodern out take because in using a female main character in such an unfeminine situation it allows Besson to play on the typical gender roles. His first photographs were published in 1921 and Best's Studio began selling his Yosemite prints the following year. His early photos already showed careful composition and sensitivity to tonal balance. Music was his main focus during his youth in his early, though after marriage his attempts at a musical career were marked to an end. The film indicates that these high tech tracers can be placed on an object nearly unnoticed, and a 3 dimensional position of the object can be relayed to a computer up to 1000 meters away. This type of equipment is already accessible to public display, making it old equipment to the NSA.